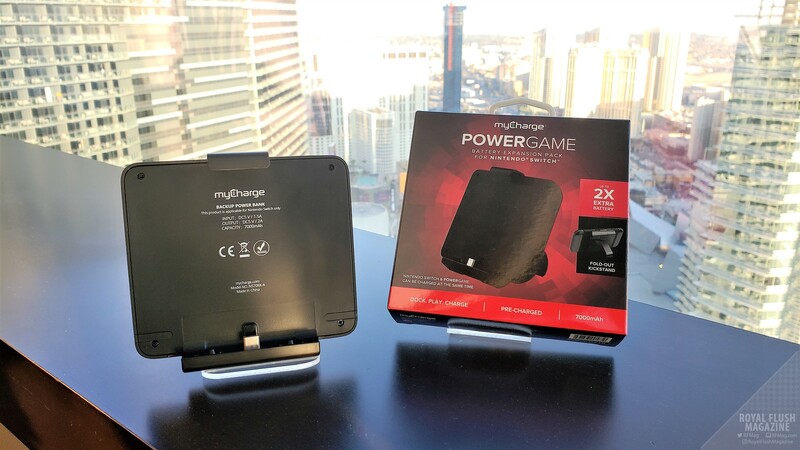 After checking out all of myCharge’s new and upcoming products at CES 2019, we thought it was right about time to focus on one of their latest releases. This time, myCharge dove into gaming with their new PowerGame power bank for the Nintendo Switch. The PowerGame clamps onto the back of your Nintendo Switch, providing battery charging for your console while you play. Let’s get into the specifics. The PowerGame is a 7,000mAh battery that backs up the Nintendo Switch’s 4310mAh battery, providing up to 10 hours of undocked gaming. The Nintendo Switch slides right onto the USB-C jack on the base while the PowerGame’s topside arm clamps down on the system, without blocking ventilaiton. Simply engage the arm’s LOCK switch on the back and the PowerGame is snug and secure on your portable console. Should you rather rest the Nintendo Switch on a surface while you play with wireless controllers, you can extend the included stand on the back of PowerGame. You also have LED indicators next to a USB-C port along the right side of the PowerGame, giving you remaining battery status while it is in use. The PowerGame is a very simple product that does what it is supposed to do while staying out of your way. When clamped onto the Nintendo Switch, the PowerGame sits tight and snuggly, no matter how violently you try to shake the console. Sure, the console with this 0.4 lbs. power bank gains a little bit of weight. However, I did not feel like it added any considerable amount of fatigue during long-term play. The stand on the back is pretty sturdy as well, as it extends right out of the center of this console and battery combo. It even felt sturdier than the off-to-the-side stand that comes out of the Nintendo Switch console itself. 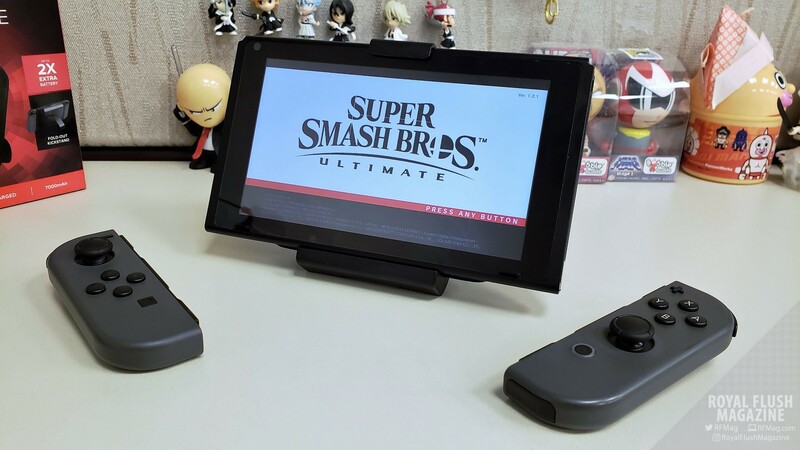 On top of all that, you can even charge the PowerGame while it is connected to and charging your Nintendo Switch. As far as performance goes, the PowerGame got the job done. The myCharge claim of up to 10 hours of continuous play is of course dependent on the game that you are playing. The more resource-heavy the game is, the faster the battery drains. So for our drainage/lifespan test, I chose to play Super Smash Brothers Ultimate on our six-hour plane ride from NYC to Vegas for CES 2019. Practically from the moment I sat down, I started playing non-stop without the PowerGame attached. Once the system complained about having under 10% of battery remaining, I finished a match and plopped the PowerGame onto the Nintendo Switch. I continued playing until the all of the LEDs on the PowerGame were off, indicating that the PowerGame’s battery was fully drained. This was right about the 5-hour mark of continuous gameplay, where the Nintendo Switch was left at a 66% charge. That left somewhere over two hours of more playing time, specifically for Super Smash Brothers Ultimate. Even if that is not 10 hours, seven hours plus of continuous play of a heavily draining game is very respectable. The PowerGame can more than double the lifespan of the Nintendo Switch. Plus, it is neat, compact, and blends aesthetically with the console, making it an excellent travel companion for any heavy on-the-go gamer. I simply could not find a knock for the PowerGame, which is an effective product for anyone looking to extend their play time outside of the house. At $39.99, the PowerGame is an easy buy for all avid Nintendo Switch players. I suggest that you check it out for yourself on Amazon here. 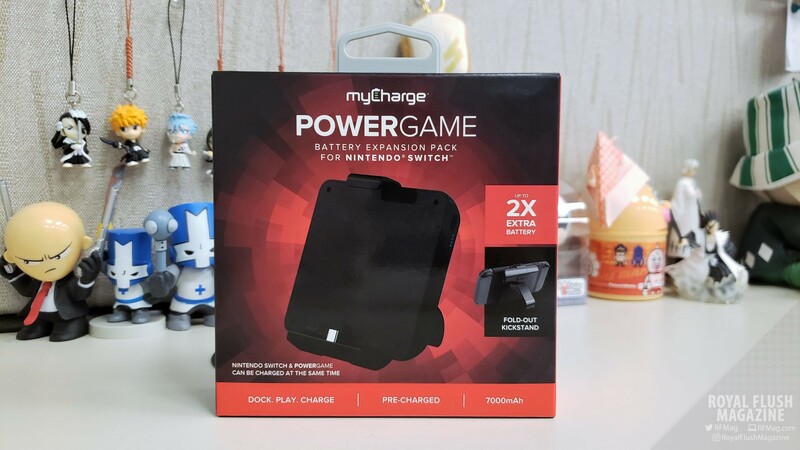 †myCharge PowerGame for the Nintendo Switch review unit provided by myCharge PR.